Dr Tony Whitten served as a very much appreciated member of Plateau Perspectives’ International Council of Reference from 2004 until 2010. It is with great sadness that we note his passing away in late November, aged 64, in a cycling accident. He was known as passionate advocate for some of the world’s least-known creatures and for new approaches to wildlife conservation, as well as his strong Christian faith and active engagement with multiple faith communities around the world. He is missed by all. All of us from the Plateau Perspectives family across many countries extend our condolences to his wife, children, and the whole family. Tony Whitten, who has died aged 64 in a cycling accident, was an inspirational figure in global conservation circles thanks to his collaboration with religious groups and his passionate advocacy for some of the world’s least-known creatures. Like the snails, beetles and mites that he championed, Whitten was never a household name, but his influence as a mentor and explorer – particularly in the caves and rocky environments of Asia – was such that 11 species have been named after him. He was also instrumental in the first fatwa declared against the illegal wildlife trade. At the time of his death, he was senior adviser at Flora & Fauna International, one of the world’s oldest conservation organisations, and had recently established a specialist group on karst habitats – the crags, caves, sinkholes and disappearing streams formed by the dissolution of limestone and other soluble rocks – for the International Union for Conservation of Nature. The son of Jack Whitten, a chartered accountant, and his wife, Mollie (nee Smart), Tony grew up in Dulwich, south London, and made regular visits with his family to London Zoo, one of the origins of his love of animals, which he retained throughout his life, along with a strong Christian faith and enthusiasm for choir. As a teenager at Dulwich college, he wrote his first scientific paper on the sense of smell of ducks (studying birds he had raised from eggs in his bedroom) and was heavily involved in the biology society – a platform he used to persuade the school to plant a run of trees, which can still be seen today. At the age of 18, he became the youngest recipient at the time of the Churchill fellowship, which he used to visit New Zealand to study blue ducks. He took environmental science at Southampton University, where he met his future wife, Jane Trussell. The couple moved to Cambridge as postgraduates, and shortly after getting married in 1976 they spent two years on Siberut, one of the small Mentawai islands off the west coast of Sumatra, where Whitten studied Kloss’s gibbon for his doctorate. It was the start of a lifelong passion for Asia, its ecology and people. The couple later lived for 10 years in Indonesia, where Whitten was employed variously for the Centre of Environmental Studies at the University of North Sumatra and the Dalhousie University of Halifax, Nova Scotia. He also worked as a consultant on infrastructure projects in China and Mongolia, joining the World Bank as a biodiversity specialist in 1995. Whitten described himself as “an odd bird” in the institution, a rare species of ecologist among the thousands of economists who made the momentum for “development” far more powerful than the brakes of conservation. Although outnumbered, he was widely respected as a scientist and a voice for the natural world. Nonetheless, Whitten was not always listened to as he would have liked. In a blog post in 2009, he lamented the decline of megafauna on the Yangtze, notably the baiji dolphin, paddlefish, sturgeon, finless porpoise and Chinese alligator, as a result of the Three Gorges and other dams on the river and its tributaries. The warning signs, he said, had been apparent almost two decades earlier when he was working to prepare an environmental impact assessment for the Ertan dam, which was to be financed by what was then the largest World Bank loan. Such gloom was unusual. Colleagues and friends described Whitten as an inspiring optimist, who spent time mentoring the next generation and was constantly willing to explore new approaches to wildlife conservation. A man of faith with an open mind, he worked with Christian, Buddhist, Taoist, Baha’ist, Jain, Sikh and Greek Orthodox leaders – as well as the archbishop of Canterbury, the British royal family and the World Bank – to help found the Alliance of Religions and Conservation, a meeting point of secular ecology and theology that aimed to find new economic models. One of his proudest achievements was helping to persuade Muslim clerics to declare the fatwa against the illegal wildlife trade in 2014. He also raised the profile of less fashionable ecological causes, writing a book on snails, publishing 111 field guides in local languages, and having Wolf Totem – a Chinese bestseller about wolves on the steppes – translated into Mongolian. He also wrote what he called “popular” books on gibbons and the ecology of Java, Bali and Siberut. He communicated with colleagues and a wider audience through a blog that mixed astute scientific observation, groan-out-loud puns and life-on-the-road adventures with tales of searching for komodo dragons in the Lesser Sunda Islands, staying at a Mongolian ger tent camp owned by a sumo champion, attending a conference at a tiger workshop in Kathmandu and reflecting on the Millennium Seed Bank in the UK (a post memorably written at the Royal Albert Hall while he was waiting for the opening strains of Beethoven’s First Piano Concerto). A move to Flora & Fauna International – which includes David Attenborough and David Bellamy among its vice-presidents – allowed him to pursue that passion. 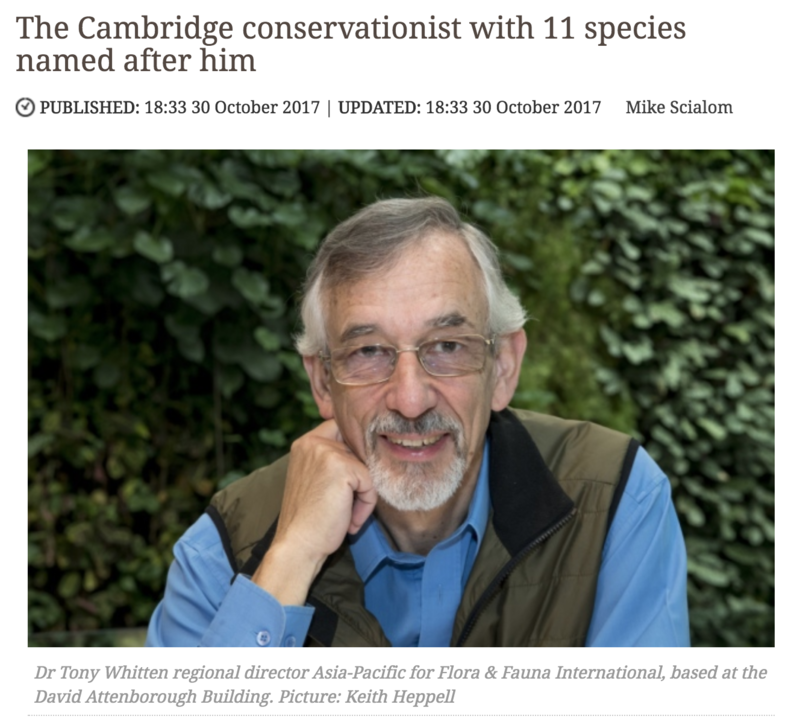 Initially working as Asia Pacific regional director, he later became a senior adviser and participated in the Cambridge Conservation Initiative, a coalition of universities and NGOs. He continued to travel, research and campaign. He lobbied cement companies in south-east Asia not to blast limestone areas that are home to snails and many other rare animals, which would cause even greater levels of extinction, he feared, than palm oil plantations. In 2016, he was part of a team that discovered 15 new species of gecko in Burma. A few days before his death he led a tour to eastern Indonesia. Species named after him include a dung beetle, a soil mite, a transluscent snail, a Bali river fish and, most recently, a gecko found in Myanmar, Hemiphyllodactylus tonywhitteni. Not everyone would want to be associated with such uncharismatic minifauna, but Whitten – ever the enthusiast for causes that others deemed unfashionable – was delighted. In an interview earlier this year, he said his personal favourite was a blind cave beetle, Pilosaphaenops whitteni, from Guangxi province, southern China, that has adapted to its dark habitat thanks to hugely elongated legs and antennae. Whitten is survived by Jane, and their children, Ruth, Peter, Jon and Andy, and two grandchildren, and by his sister, Mary. This entry was posted in Media on December 14, 2017 by laoban.